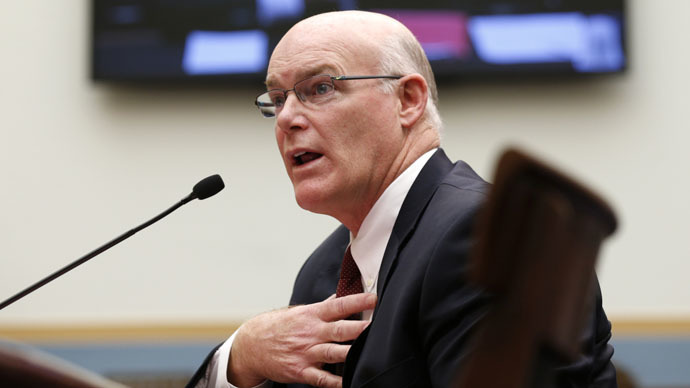 Secret Service director Joseph Clancy came to Congress asking more money for 2016, including $8 million for building a replica White House, but had a tough day dodging questions about his agents’ alleged drunk-driving escapades instead. Called to review the Secret Service’s budget for fiscal year 2016, much of Tuesday’s hearing in the House Appropriations Subcommittee on Homeland Security was devoted instead to an incident two weeks ago, allegedly involving drunk agents running into a White House fence. Lawmakers grilled Director Clancy, demanding changes in the agency culture and that “heads roll” over the incident. The director promised action, but claimed he had to follow “due process” and would punish agents only after a full investigation. “You’ve got a big job, and you’re going to have to make some heads roll,” Rep. John Carter (R-Texas) told Clancy. Carter suggested some agents might have to be sent “to the Mojave Desert,” meaning a punishment detail or exile. Rep. Nita Lowey (D-NY), a ranking Democrat on the committee, called Clancy’s testimony “shocking,” in particular his plea for time to change the agency’s culture. “I would think it would take five minutes to change the culture,” Lowey said. Rep. Chris Stewart (R-Utah) likewise scoffed at Clancy’s explanation that he was moving slowly in order to earn the trust of his agents. “Dude… you’re their boss. They’re supposed to earn your trust,” Stewart said. Chairman of the House Appropriations Committee Harold Rogers (R-Kentucky), called the recent incident “a breakdown of discipline” and “a cancer” that Clancy would have to eliminate. “We’ve got to have some changes. And you have to be the one to make those changes. And I don’t sense at the moment that you have the determination to make that happen,” Rogers said. Instead, President Obama appointed Clancy, former head of his security detail and a 27-year veteran of agency. Clancy ran the Secret Service as interim director from Pierson’s resignation to his permanent appointment in February. However, the agency did take note of last fall’s report, in particular the advice that “a security team should also be trained so it is intimately familiar with the space in which it is operating.” For that reason, the Secret Service is now asking for $8 million to build a replica of the White House at its training grounds in Beltsville, Maryland. The request is part of a $273 million increase in funding for the fiscal year 2016, justified in part by the upcoming presidential campaign. If approved, the agency’s 2016 budget would be $1.94 billion. Created in 1865 to fight counterfeiters of currency as part of the Treasury Department, the Secret Service is better known as the presidential protection detail, a duty they assumed in 1902 following the assassination of President McKinley. Part of the Department of Treasury until 2003, the agency is currently subordinated to the Department of Homeland Security. Its director is appointed by the president.